genesis-news.com: What was the idea with the Squire/Hackett cooperation? Did you start with a complete plan or did you just set out not knowing what could happen? 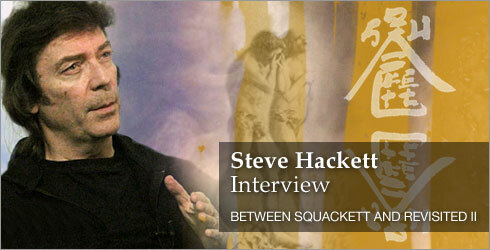 Steve Hackett: We started out playing on each other's records. That's how it started to happen. And Chris, he wanted to do a Christmas album of Christmas carols, and I played some guitar on that one, and he did an album with a choir. This is several years ago now, of course, some years back, and I still think of it as recent times, really. Then he returned the favour by playing on a number of tracks that I did that were proposed for an album, and then I had to put things to the side because I was in the middle of legal complications and other issues that got in the way of it. We recorded quite a lot of things, and I thought he was really going to play on that album of mine, and then I started another album with him from scratch. We were talking about releasing it and then he moved to America in the middle of recording because his wife was expecting a baby and she wanted to be with her family in Phoenix. So I sort of stopped work on that, and then started work on a third project, which was Out Of The Tunnel's Mouth. Luckily, Chris was on a couple of tracks on that already. The lovely thing about that was that with my third attempt I had an album that sounds really light. I couldn't afford for it to fail because I had done so many attempts to make an album, always outlaying and not much money coming in. Luckily, that one took off in a big way with Inside Out. Then I got back to some of the stuff that was intended for the original album, and Chris said, „Oh couldn't we have some of that for a combined project, our album together?” and I said “Oh I'm not sure, let's see.” And I thought, well if I try and I keep him happy with that solo material we could make band material and he played beautifully on it. Tracks like Divided Self and The Summer Backwards were originally intended for a solo thing, but it worked out very well, and eventually we have Squackett, and eventually, of course, I did Shrouded Horizon before that and Chris is on lots of that. It's a complicated story. It's a bit like there's a number of canvasses and a number of painters and we're all working on them sometimes at the same time and sometimes separately. But the Squackett album is done, and I'm hoping the 5.1 is going to coming back in good order today, otherwise we're going to miss the release date because they keep doing it and... When you have these copies done sometimes they come back with distortions and dropouts and various things, so it's not always the process of recording from the musician's end. It's the technical end that is making the albums work. The 5.1 sounds very good. If they can manage to get it in time in the way that we managed to mix it in time with Roger as producer it sounds very very good. GNC: Who had the idea for the name Squackett? Steve: Actually, it was Chris's wife's idea. Funny. Her name is Scotland, and we call her Scottie, and she suggested the title which was a humorous title for it. We'll make it a friendly thing. GNC: How did the song writing process work? Did you join in a studio or did everybody work separately on an idea and then choose the best parts? Steve: Many things were written face to face, and sometimes in the studio, sometimes at home in the living room, very often with myself and Roger and Chris each contributing a line and a suggestion, particularly with lyrics. With a track like, for instance, the opening song, it's called A Life Within A Day (the album is actually called A Life Within A Day) - at least it was the last time that I looked it was going to be called that. You know, anything can happen within the final frontier, until it's finally released. The songwriting... I have to say that we have collaborated as much as possible on the songwriting. Some things were written separately, but a lot was written face to face. We took the Genesis philosophy of the early days where if you contributed a part you were part of the writing crew of the song. This idea appealed to everybody 'cause it meant that everybody could get properly represented as songwriters and as players. GNC: Who played on the Squackett album? Steve: It's myself, it's Chris, it's Roger King, it's Jeremy Spacey on drums and Amanda Lehman who is on some backing vocals on two tracks. GNC: What is similar to your two previous solo album? What isn't? Steve: Well, I think it's a little different from the solo albums. I think it's really an album that's song-based. We have a lot of songs on the low harmonies, and not too many tricky time signatures. Most of it is 4/4, but the opening track has more of what I think people would expect from the combination of histories … In other words, something that's more detailed and more complex with time signature and odd-length bars. But in the main it's very melodic, that's the thing, apart from the crazy section in the middle of the opening track where it's sound like... it's so busy, it's like a game show. We tried to cram this thing in because we were thinking of a life within a day as something very fast happening in a very short period of time. It means the bass end of things is very developed, and we have orchestra on that track as well, so it's interesting. GNC: What are your plans for Squackett? Do you have plans to work together on another album, or maybe play live? Steve: I'm hoping that we'll play live together. We're trying to work out the logistics for that because Chris is very busy with Yes, globetrotting, and he is living in America and he seems to be currently living in Australia, so I hear. I'm not sure what's going to happen with regard to that. I hope there'll be some live work. GNC: Why is the Squackett album not released on your own label? 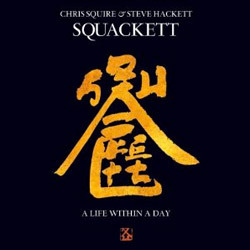 Steve: Because Squackett is a project with myself and Chris and obviously everyone else. He wanted to get a manager involved who would get a record company involved, so it's... The shared responsibility of all means that the sign says Cherry Red instead of the usual labels with me. As I said, it's not a solo project, it's a shared partnership. GNC: What's the story behind the cover artwork? Steve: The story behind the cover artwork is that Chris found an artist that he'd liked the work of. The guy has come up with something that is a cross between hieroglyphics in an oriental style and a logo of Squackett. Apparently it's gold on black, and I think it looks very nice. GNC: Is it in a language, does it mean anything? Steve: Well, I don't know if you can read it or not. To be honest, I've been so busy with so many things, I don't get the chance to really look at anything more than once. My life has been very busy with a number of projects, and Squackett is one of them. I think it may be possible to read it, I don't know, it's on the borderline; it's very abstract. GNC: It seems you like the idea of working with artists you haven't worked with before? Steve: Yes. Yes, I do. I enjoy working with Chris. I found the songwriting process very easy with him. There have been many other people I have done collaborations with in recent times. There were lots of them. They are all out there, all of them - Steven Wilson, Gary Husband, Bill [sic] Reed of Magenta, that's still not released yet but it will be – and they are all very good projects in their own way. I'm talking to a lot of people about doing a number of things. I'm also working on a Genesis Revisited No.2 and developing things on that. I recorded a version of Afterglow with John Wetton singing. He's supposed to be working with me tomorrow, on Thursday – I'm looking forward to hearing that. I've been working on Blood On The Rooftops, extending the intro into something which is perhaps more developed, that uses a little bit of the themes you'll hear later on. This is all developing, and I'm not trying to make it exactly like the original, but I'm trying to create a balance between what's authentically Genesis, but at the same time with a twist, occasionally, where I think things are developed, and I changed the instrumentation from time to time. GNC: When can we expect to see this released? Steve: Well, I hope that that will be out in October. I certainly hope so. You know it's difficult to say exactly. It will be out probably in the autumn if I manage to finish it and if I manage to get all of the personnel, of course. It's important to find the right people to play and sing it. It's taking shape, anyway, we'll see how it goes. GNC: It would be a nice Christmas present for us. Steve: It would be nice, yes! It would be the same, but different. GNC: Can you tell us who you have scheduled to record with? Steve: Well, a lot of them have said that they would, but I don't want to say too much to get people's hope up if there is no actual confirmation, you know what I mean. It's a long way to Tipperary. GNC: Do you sit down and practise playing the guitar on a regular basis or can you do without practising your chords and technique because you always have an album in the pipeline? Steve: I would say practising guitar and writing has always been the same thing to me. I always try to play things that I can't play. It's a continuous frustration to me not to be able to play things in one go that I write, but eventually, with enough practise it's possible to do all manner of things, but... I was talking about this with someone the other day. We were talking about the way music students get to learn to play stuff, and he was saying it was terrible to teach people to play scales the whole time, it's so boring. But if you teach someone to play a Bach piece from the word go the scales are already there in the piece, so it's much more interesting. He taught me about keyboard playing, the keyboard work of Bach, which I imagine every player would like to be able to do, every keyboard player. You have to be very gifted and very dedicated to do that. Meanwhile I'm jumping through my own hoops, making something like a circus act, you know, jumping through these rings of fire that I create for myself. Trying to jump over those fences can sometimes be difficult enough, believe me. I don't do complications just for their own sake, otherwise you wouldn't have half the Genesis stuff that you like, where you have these very florid accompaniments to the songs. It's just part of it. It's just part of the Genesis style, wasn't it, to have not just the chords but all the acoustic detail of those songs, whether it was keyboards or guitars doing it. There was a complexity there, but a simplicity of intention at the end of it. It's not just a band playing fast for the sake of it, it's a bit like Bach. There's a direction to it. GNC: What is the music you like best at the moment, and what was the last album you bought? Steve: The last album I bought … d'you know, I can't remember, because there is so much music that's been through here. I think I end up listening to a lot of von Karajan. A lot of his orchestral work with the Berlin Philharmonic sounds like the best classical version of things I've heard. I enjoy that. I enjoy listening to Joe Bonamassa, I like his blues guitar style, I enjoy that very much. The last album I bought was probably something like Florence And The Machine, which is very interesting. There's an album with Joe Bonamassa and Bess Heart, which sounds very good. Some of the new people... I think Florence And The Machine has, although she's a female singer, almost a kind of tribal approach to it. It sounds like there's some Gabriel influence in there to me. She's done it very well with a woman's voice. She's got quite a lot of power with it. It's the second album that took me up, but I can't remember the title of the album, but it's an interesting album. About six tracks on it that I would really recommend. GNC: Well, that's about all of the interview. Steve: Oh. Thank you. Say hi to everybody. We'll see you soon. I'm gonna be over doing the Lorelei in a while and one or two other things, so I will be in and out of Germany.